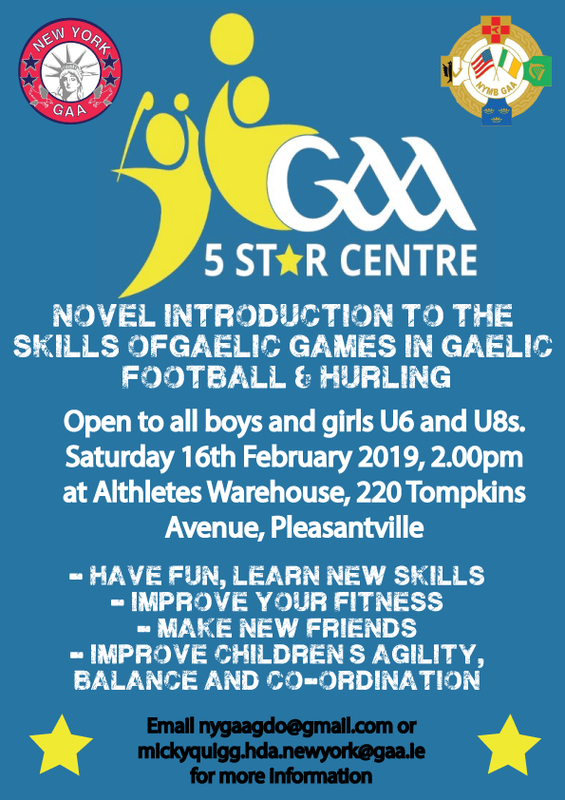 The GAA 5 Star Centre is a novel introduction to Gaelic football and Hurling. The pilot is created and approved by Croke Park to go into Schools in Ireland, but has been adapted to fit the club scene for New York GAA. The program is aimed at U6 and U8 players. It is a combination of fun and games based activites complemented by the appropriate skills and techniques, that introduces kids into Hurling and football together. Players are gauranteed to improve their coordination, balance, stamina - and most importantly have fun and make new friends from different clubs. We ask that clubs send two U8 coaches down, preferably one Hurling and one football to learn a few new games and activities they can then bring into their own sessions.